100% Infection Free Computer !!! per month with NO hidden cost! Stop SPAM phone calls !!! One FREE hour of business help - flyer! Learn how to "Worry No More"
Our proven platform is even used by NASA! We service homes, and businesses in and around Chatham, NJ. We offer very competitive hourly rates and fixed priced quotes. or we can provide convenient pick-up and delivery service. Computer or server problems? Slow computer? Infected computer? Internet issues? Wireless issues? Computer network problems? Other issue with your technology? Need your "own personal IT support company? 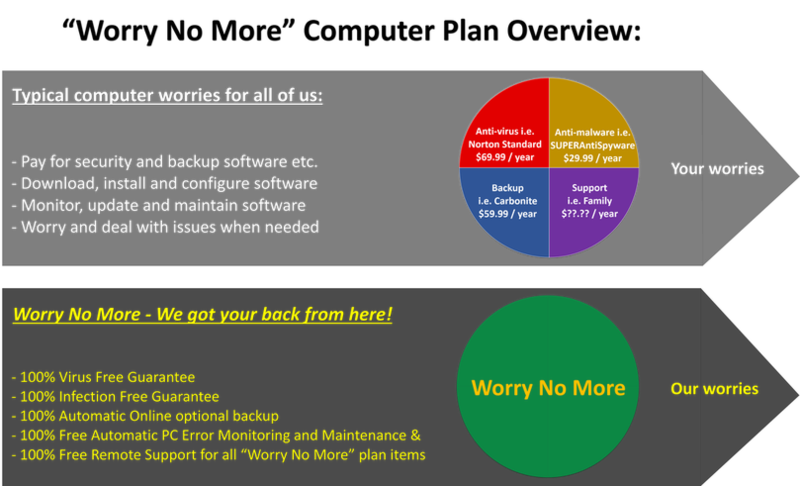 Worry No More - we provide that type of managed IT services as well. • Do you know that you can download a free "Microsoft office compatible" software suite from www.OpenOffice.org? • Do you know that you can send free secure Emails via www.SendInc.com? • Do you know that you can use simple and free services like www.SendSpace.com to exchange files too big for Emails? Call 973.387.0130 and ask us how we can help you! 19 Year old Mikael Granlund (Minnesota Wild 2010 first round pick) from Finland was busy upsetting Russia at the World Championships with a crazy goal (1-0) that lead to a 3-0 victory. Finland would thereby book a date in the gold medal game against rival Sweden. Today we got a glimpse of what the future might be like for the Mikael Granlund. Finland won 6-1 in the final game against Sweden and became World Champions. What a start for the 19 year old Mikael Granlund !!! For full (Finish) tribute click here.